WASHINGTON (CNN) -- The United States and Britain said Wednesday they are committed to remaining in Afghanistan, despite increased military casualties and declining public support for the war effort. 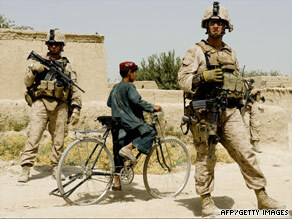 U.S. Marines partrol part of the Gharmsir district in Afghanistan's Helmand province on Wednesday. "We went into this together, and we will work it through together because we are stronger together," British Foreign Secretary David Miliband said after a half day of talks at the State Department with Secretary of State Hillary Clinton. Clinton praised Miliband's approach on Afghanistan, including the call for the government to reconcile with moderate elements of the Taliban. "His analysis of the way forward is very much consistent with ours, and we will continue to stand shoulder to shoulder in pursuit of our common objectives," Clinton said of her counterpart. In a speech at NATO headquarters on Monday, Miliband called for rank-and-file Taliban to be given the chance to reconcile with the Afghan government, even as the campaign continues against Taliban commanders who are waging jihad. He also urged greater burden sharing not only among NATO allies in Afghanistan but by the Afghan government. "There is a lot of talk, rightly, about burden sharing within the coalition, but the greatest burden sharing must be between the international community and the government of Afghanistan, which increasingly needs to take the lead -- the security lead, as well as the political lead -- in shaping the future of that country," he said. Richard Holbrooke, the U.S. special representative for Afghanistan and Pakistan, told reporters that boosting the training of Afghan forces would be a big focus after the country's August 20 election. When asked whether the election would be fair, Holbrooke, who just returned from the region, said he had heard complaints from all sides but was not "unduly upset." "It's an extraordinary thing to hold an election in the middle of a war, and this is the first contested election in Afghanistan in history," Holbrooke said, adding the United States has no favorite candidate but only wants "an election whose outcome is accepted as legitimate by the Afghan people and the world, which reflects the desires of those who vote." July has been the deadliest month for U.S. and British forces since the U.S.-led invasion in 2001, with 39 U.S. troops and 22 British troops killed. Miliband said the effort was going through a "tough phase," but added that the British people understood the "vital nature" of the mission to stabilize Afghanistan. British Prime Minister Gordon Brown has been under under enormous pressure from his opposition, which charges that British troops don't have proper resources to fight the war, including helicopters. But he was sanguine. "I think the British people will stay with this mission, because there is a clear strategy and a clear determination on behalf of the United States and other coalition members to see this through," he said, adding that the British people understood the mission's "vital nature." Americans, too, have questioned whether the war in Afghanistan is winnable and worth the effort. U.S. Defense Secretary Robert Gates and members of Congress, including Democrats, have predicted that President Obama has a year to show progress in Afghanistan before public support for the war further erodes. Clinton said Britain and the United States "have made significant gains in the recent operations" against the Taliban, but "there remains much work to be done." "We know that this is a challenge that is not going to be easily resolved in a short period of time," she said, adding "both of our countries are still threatened by the same enemy, an enemy that has attacked London, New York and Washington." "We know they've attacked us in the past, and, unfortunately, we know that they plot against us even today," she said.